A light source of the right quality. Both natural and artificial light sources can vary so much that light must be accurately measurable in order to grade its performance. The three key performance factors of light are colour temperature, colour rendering and spectral power distribution. This is expressed as Kelvin (K) and has nothing to do with heat. Instead it attaches a value to the colour appearance of a light source, and this varies with its spectral powerdistribution (see below). For example, fluorescent lamps such as the CIE Illuminant 'A' have lower colour temperatures and so look red; while lamps with a higher colour temperature such as the Warm White Fluorescent look blue. There are three CIE ‘Daylight’ illuminants: the most widely used is D65 (6500 K) for surface colour industries - paint, textiles, plastics etc - and D50 (5000 K) for the graphic arts industry. Other specialist applications use D75 (7500 K). CRI values measure how well a lamp renders colours relative to a reference light source. The CRI index ranges from 0-100, with 100 representing an exact match. A lamp such as the PHILIPS D65, with a CRI of 98, will therefore show colours more accurately than a lamp such as the CWF, with a CRI of 62. CRI rating is recognised by the Commission International de l'Éclairage (CIE) and the Illuminating Engineering Society (IES). Light is made up of the visible part of the electromagnetic spectrum, which the normal human eye sees as colours. But some light sources are highly concentrated at different areas of the spectrum, and this distorts the colour appearance of objects. For this reason SPD rating is used to numerically characterise a light source. This is done by measuring its relative SPD values at each discrete wavelength. This measurement is compared against the CIE standard to determine how well that particular light source renders or distorts colours. D65 is the CIE’s recommended light source for colour assessment, as it comprises the entire electromagnetic spectrum in almost equal proportions. Eventually, finished product will be seen by your customers at a point of sale. It's therefore important to determine at the design stage how you want the colour to appear in those critical lighting conditions and in everyday use. Lux is a unit that measures the volume of light. Lux level requirements vary according to the task you want to carry out and the materials you’ll be working with. Too low or too high a lux level makes correct colour rendering impossible. If two coloured materials have identical spectral reflection curves, they will match visually under any illuminant. If they have different spectral reflection curves, they may match visually less than one illuminant but mismatch under another. Such matches are termed metameric, and the cause is usually a difference in the colouring matter used in each material. 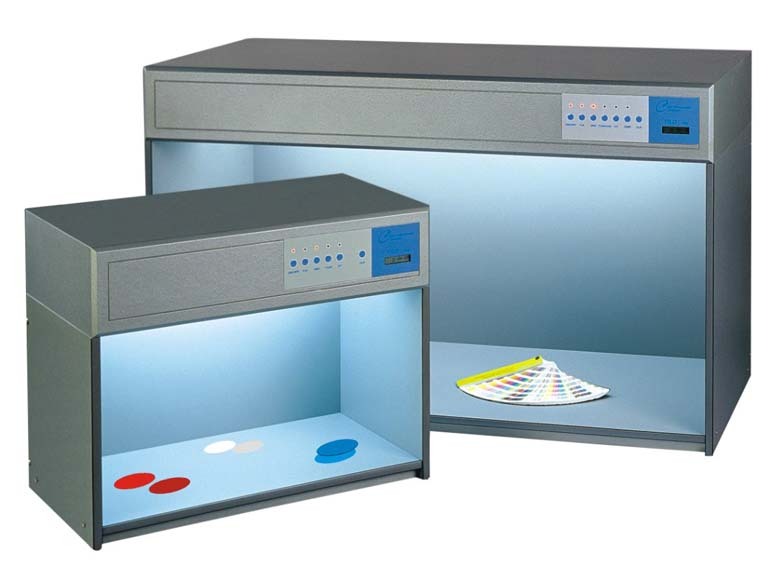 Metamerism can be checked in a TILO colour assessment cabinet, which has up to five different light sources. This and the flexibility of TILO’s unique switch control unit enable instant switching among lamps to measure fine metameric differences. Colour assessment cabinets must have neutral and blemish-free matt grey interiors. The quality of the lamp reflector is also important: a poor reflector will distort the light from the lamp. TILO reflectors use a special white coating, designed to maximise quality by reflecting all light evenly. The siting of the cabinet is critical. For best results, all sources of interference with the visual response - for example glare or extraneous lighting - must be eliminated. Any windows near the cabinet should be fitted with grey blinds; there should be no direct light in the field of view; and all general lighting nearby should be PHILIPS ‘Artificial daylight’ to a level of 200-300 lux.